Castaneda's unique soccer team, the Aztecas, unites rival gang members on the playing field, builds character and discipline, and steers youth away from the street life. 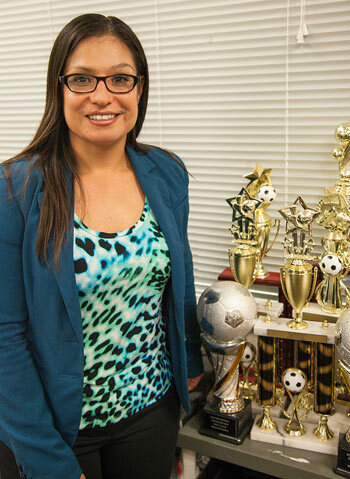 Gina Castaneda is a a deputy probation officer for Santa Cruz County and head coach of the Aztecas soccer team. Theresa "Gina" Castaneda grew up in the shadow of gangs, but the discipline of team sports gave her a way out. Now, Castaneda, who will receive the sixth annual Tony Hill Award during this year’s 30th annual Martin Luther King Jr. Memorial Convocation in downtown Santa Cruz, is using sports to guide troubled youths away from the streets. This special honor recognizes individuals whose lives and actions exemplify the late Tony Hill’s work and legacy. Hill, a longtime advocate for social and economic justice in Santa Cruz County, was known for his skills as a community bridge-builder and mediator. He died in 2007 at age 62. Award recipients receive $500 to donate to the charity of his or her choice. The convocation takes place at 7 p.m., February 6, in the Santa Cruz Civic Auditorium in downtown Santa Cruz. The event, featuring Freeman Hrabowski, III, who marched in Martin Luther King Jr.'s legendary Children’s Crusade in segregated Birmingham, Alabama, in 1963, is free and open to the public. You might say Castaneda leads a double life; she is a deputy probation officer for Santa Cruz County and head coach of the Aztecas soccer team. But in this case, the occupations overlap; the young soccer players on her team are “high risk” youth including a number of gang-involved teens. The team gives them an alternative to hanging out in the streets and getting in trouble. More importantly, the Aztecas instills a healthy version of the values that gangs put forward to recruit new members: identify, affiliation, trust, respect, friendship, loyalty, fun, honor, duty, and responsibility. But make no mistake: the Aztecas is a real team, and the players are highly competitive. These young athletes play to win, whether they are trouncing a team made up of police and probation officers or squaring off against members of the local adult soccer league. Several team members are associated with the rival Norteño and Sureño gangs; however, on the field they share the common goal of victory. In a happy coincidence, the team's official color is purple, the color you would get if you blended red and blue paints together. Red and blue are, respectively, the traditional colors of the Norteños and Sureños. When Castaneda guides her team, she’s drawing from a deep well of painful memories. During an electrifying TedX Santa Cruz presentation two years ago at Cabrillo College in Aptos, Castaneda spoke in blunt terms about her childhood: Her mother was a gang member with a drug problem, her oldest brother is serving a 20-year prison term, her second oldest brother served time in county jail, and her sister had five of her children taken away by Child Protective Services. As a young girl, she needed the protection of gangs to survive; at one low and especially vulnerable point, she was 13 years old and homeless, and a gang member provided housing for her and her mother in a junkyard trailer. But there was an unwanted cost for this temporary roof over her head. When Castaneda refused to carry drugs and weapons for her so-called protectors, she was kicked out. Miraculously, in spite of all she went through, Castaneda thrived. By age 16 she had moved out of her abusive household and was supporting herself financially while raising her 11-year-old sister. With the help of her beloved stepfather, Ernesto Medina, Castaneda's earliest soccer coach, as well as a former pro soccer player in Mexico, and co-creator of the Watsonville Men's Adult League, she went on to be a star soccer player at Aptos High School, earning distinction in the school’s Hall of Fame. Today she channels her enthusiasm for sports into a voluntary program that is so popular, it has a waiting list, and so enjoyable for participants that some of them stick around as peer mentors after they’ve aged out of the team. The early days of the team were rough-going as new players struggled with rules and discipline, but gradually a culture of respect was instilled, with more senior players urging new arrivals not to play under the influence, not to act like ‘homeboys,’ never to show up ‘buzzed’ for matches or practice, and not to blow their chance of winning. The program is still young but Castaneda is noticing the impact; parents, sisters and brothers of at-risk teens have thanked her for steering youth away from lives of addiction and criminality. In his letter of recommendation for Castaneda, Santa Cruz County chief probation officer Fernando Giraldo mentioned Castaneda’s commitment and heart; she takes the time to work with youth that others find intimidating and would just as soon leave alone, he said. "Many of them used to play soccer when they were kids and could still smile,’’ Giraldo said. "Gina wants to get their smile back."